I have a piece up at Politics Daily on Helen Thomas, published yesterday shortly after Helen’s retirement was announced. Yes, I know her remarks were offensive and antisemitic and I don’t defend them. But I don’t think she deserved to be forced into retirement for speaking her opinion when her job is to be an opinion columnist. She issued an apology, as most opinion columnists do when they say something stupid. If you’re interested, the full piece is here (my first piece in Politics Daily!). For all the outcry around the Israeli flotilla attacks, perhaps one of the most important things to come out of it is that the world is finally paying much-needed attention to the longstanding Israeli blockade of Gaza. Ultimately, the international uproar coming out of this situation is not the product of one isolated incidence of violence but of a series of actions that have taken place for years in Gaza and have, until now, been largely ignored by most of the world and certainly by the United States. 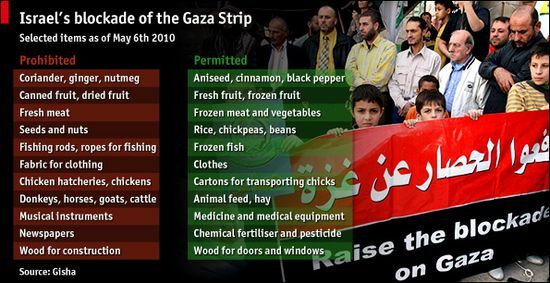 Israel has imposed an embargo allowing only food and humanitarian aid into Gaza – nothing else. Which means that they can’t build any homes, schools, hospitals or other infrastructure in Gaza because no supplies can get in. This, in turn, has kept Gaza in a terrible state of poverty for years. And this situation has been going on for far too long with much of the world ignoring it – so maybe now, as a result of the Monday attacks, international attention is finally being turned to Gaza. As Foreign Policy magazine writer Marc Lynch tweeted today: the focus of coming days should be on Gaza itself, not just the boat. UPDATE: This extremely interesting graphic from The Economist shows just what is and isn’t blocked from getting into Gaza. The following is an excerpt of my latest post with AOL’s Lemondrop.com. To read the full post, click on the link at the end of this post. Contrary to the news media’s coverage, the protests in Iran contesting the reelection of Mahmoud Ahmadinejad didn’t end when Michael Jackson died — though they are fading. One of the most intriguing facets of the protests is who’s at the forefront: women. In a country not well known for women’s rights, this is quite remarkable. You might have heard about the death of Neda Agha-Soltan, a young Iranian woman shot in the streets of Tehran. Though it’s worth noting that Neda’s family said she wasn’t political, she has become the female face of the protest. Women have been vocally supporting the candidacy of Mir Hussein Mousavi, the chief opponent to incumbent Mahmoud Ahmadinejad, who was declared the winner the morning after the June 12 election. While the Guardian Council — which oversees elections — did a partial recount after Mousavi filed an appeal, the original results were upheld. For the last four weeks, women have marched alongside other protesters through the streets of Iran, even as officials try to stop them, tear-gas them or beat them. Click here to keep reading. The following is an excerpt from a guest post I recently wrote for NPR.org’s Intern Edition blog. They are doing a series of guest posts asking young people to write about their thoughts on the future of journalism. To resad the full post, check out the link below. In the year 2015, the New York Times as we have known it will cease to exist. It’s now known as the newspaper of record, with a decorated, storied history spanning over a century and a half. Its Pulitzer- and Nobel- prize-winning columnists have become household names: Friedman, Dowd, Krugman, Collins, Brooks, Rich, Kristof, Douthat. But now the paper that has for years been the star of modern journalism is struggling just to survive under the combined pressures of a $250 million high-interest loan from a Mexican billionaire and the lack of a viable business model in an era of declining ad revenues and that thing we call…The Internet. The internet has now become the premiere way for Americans to get our news, and the old tradition of starting off mornings with the newspaper over breakfast has been traded in for hastily checking your Blackberry for news while in line at Starbucks. But although the fate of the New York Times and other mainstream media outlets looks bleak, the future of journalism looks, from my vantage point, exactly the opposite — I think journalism has a bright, exciting future. Because now we see the rise of citizen journalism, where everyone is empowered to to contribute to and report the news. And with more people and more diverse perspectives reporting and collecting news, our collective access to the information we need can only increase. The new journalism is about citizen journalism and community journalism. Blogging and the internet have helped connect reporters with their audiences and reduced the barriers between them, and now everyone can report. Everyone has access to publish content, to report events as they see them happening, and to have their accounts read and heard by hundreds, thousands, even millions, around the world. A YouTube user could create a video and get 10 million views. A blogger broke the story about Khalid Sheikh Mohamed being waterboarded 183 times and then it became a mainstream news story. Twitter users in Iran are sharing their accounts of election protests taking place there, while much of the mainstream media has been banned from reporting on the events. Is America shifting on Israel, or is the media shifting on Israel? One of the things I love almost as much as the news is the narrative being told about the events. It’s difficult for any given person to separate the facts and the actual events taking place from the media narrative being told about it. The Iran story that I’ve been watching lately is a perfect example. No one is really 100% sure what the facts are or what even constitutes fact. MSNBC will spin it one way. Fox and/or Mitt Romney will blame Obama. Bloggers will each try to put their own spin on it. And gradually, the narrative being constructed by the media may or may not reflect the actual facts. Since Iran has been the Middle East story of the week, and America seems to be able to focus on only one Middle Eastern country at a time, the other big Middle East story of the week hasn’t been getting quite as much attention other than from foreign policy geeks. That story, of course, is the Israel-Palestine peace process. A few weeks ago President Obama met with Israeli PM Benjamin Netanyahu. In early June, Obama delivered a speech to the Middle East from Cairo. This past Sunday, Netanyahu addressed his people on the topic of the peace process. After these three historic events, a new narrative has emerged: America’s relationship with Israel is changing. Over the past couple of weeks have seen a plethora of articles and blog posts from both seasoned journalists and amateur bloggers alike, all suggesting the same ideas: the power of the legendary Israel lobby is weakening. President Obama is pressuring Netanyahu. Obama is the next Jimmy Carter [because Carter was the last US president who put real pressure on Israel to make peace]. Americans are gradually shifting from unconditionally supporting Israel to supporting a two-state solution. America’s relationship with Israel is changing dramatically. It’s a new chapter in the two countries’ relationship. The question to me is: has American public opinion on support for Israel really changed? Or is this a shift in the media narrative but not actually a shift in America’s opinions and policy? Is the course of American foreign policy really shifting, or is this talk from speculative cable news pundits? Is it REALLY a new era in America’s approach to Israel and Palestine? Or am I hoping for too much here? There’s a lot of noise circulating right now about how the mainstream media networks like CNN and Fox have failed in providing adequate coverage and on-the-ground reporting on the events taking place in Iran. But there hasn’t been much talk about who HAS been providing stellar coverage of the situation. Over the last couple of days I’ve been glued to Andrew Sullivan’s blog over at The Atlantic. Andrew’s blog is already high-quality content on a daily basis, but over the weekend he began blogging up a storm in real time as the events unfolded in Iran. Unlike big mainstream media outlets, whose reporting has been hindered by elaborate quality regulations, a lack of foreign bureaus to provide them direct on-the-ground footage, and a strong dislike for all forms of new media, Andrew’s blog has been going nonstop, hindered by none of those things. He is updating multiple times a day, sometimes multiple times an hour, every time he has any new piece of information. He is gradually weaving together a complex narrative of the events taking place half a world away by piecing together a collection of eye-witness accounts, Iranian tweets, cell-phone videos uploaded on Youtube, reader emails from the US and from far away, riveting photos, and links to a multitude of blogs both big and small. Old media types might shudder at the idea of linking to an unknown blog, but new media journalists like Sullivan aren’t concerned about how big the readership of your blog is or whether you’re just a student writing your observations on Twitter. It’s not about your press credentials; it’s about free flow of information. In this new media landscape, if you’ve got information, it’s worth sharing — no matter who you are. CNN and other MSM outlets are running a few articles about what’s going on, but they can’t compete with this – real-time accounts through a variety of different mediums, collected together in one place being updated by the minute. If you haven’t checked it out yet, you need to. Sullivan’s blog is becoming the only source worth reading for accurate, detailed coverage of the events in Iran. This is what journalism should be. I don’t have anything new to say about the situation in Iran this weekend. Really, no one in the US knows anything more than anyone else does. There’s no official confirmation yet on whether the election was rigged, but anyone with half a brain can see that there is clearly foul play going on. I think what is interesting and unique in this case is that a rigged election could have happened in a developing country 30 years ago and the people would have had to put up with it. But this time, they can’t and they won’t be silenced. 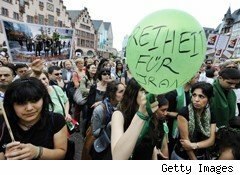 The lengths to which the Iranian regime has gone to silence them — shutting down internet connections, ordering reporters out of the country, attacking protesters — are tremendous, but the protests continue on anyways, growing in strength by the hour. And despite the fact that MSM outlets like the BBC are being kicked out or having their cameras and film taken away, and CNN is barely reporting, worldwide coverage of the situation is growing thanks to Twitter and the blogosphere. Did their organizing via Twitter work? You decide. You are currently browsing the archives for the In the news category. Nisha Chittal is a writer in Washington, DC. She writes about politics, media, technology, and foreign policy.